You are in search for the best industrial or commercial grade sewing machine for 2019!. Right? It’s quite difficult to make that decision. 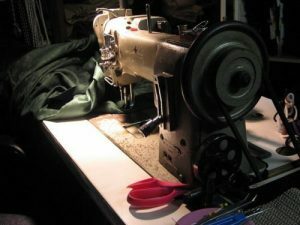 Finding the best industrial sewing machine for your sewing needs while getting a product that provides durability, performance, power, and value can be difficult. 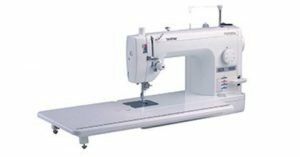 That is why I’ve researched many different sewing machine options and have reviewed our top 4 choices in one convenient place for you. Here are the 4 best industrial sewing machines below for your consideration. Take a look at the list! Confused! Don’t worry, I will not just ask you to blindly decide, but will guide you and help you make the right choice. So before I dive in on the review, I’ve got some important information for you. Don’t pick or buy an industrial sewing machine before reading this little guide below. If you want to head straight you can skip with the link below. The industrial sewing machine of a tailor or dressmaker will differ from that of a manufacturer of leather sofa and car seat covers. The equipment may be manufactured only to suit light-medium fabric while some may only be designed for thick materials like canvas or leather. Some manufacturers offer a guide on what model to use for specific projects. But to be safe or if there’s no guide available, remember that the lifting height of the presser foot should be more than 3 millimetres higher than the thickness of your material. In this way, your leather, canvas or whatever fabric you use can smoothly move in and out under the needle. Most traditional industrial sewing machines are noisy, especially when they are run with a clutch-type motor. While it may not be much of an issue when you’re using the equipment in a huge garment factory, you might want to reconsider if you’re using it for domestic use. Luckily, there are brands that market their products as something with noise reduction features. If you can’t find one, consider sewing equipment that runs on servo motors, which is known to operate quietly. Some industrial sewing machines are delivered to your home as already assembled units packed in shipping pallets, especially when they come with the baseboard. So before you order your product online, make sure to know the shipping and unit dimensions to ensure that the product can pass through your door. If you have a vast space in your factory, the huge traditional ones won’t be a problem for you. But if you have limited space especially when working at home, you might want to opt with units that are made of light materials and offer a high degree of portability. Ok, as promised here are the review of the top 4 industrial sewing machine. I started from the top, so make sure you get to the bottom. 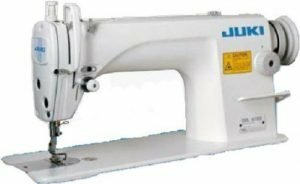 The Juki DDL 8700 straight-stitch sewing machine with a top of the line powerful servo motor is a great industrial strength sewing machine that is perfect for home use. It has a dimension of 48 x 20 x 48 inches and weighs just under 30 pounds. It offers great stitching speeds with a max sewing speed of 5,500 stitches per minute. Juki DDL 8700 is perfect for lightweight and medium-weight fabrics and is a great deal. With this machine, you can be guaranteed faster speeds and perfect stitches every time. This great industrial sewing machine is brought to you by a world leader in sewing technology and quality. Between the quiet motor and the large sewing space, this unit provides a comfortable operating experience every time. If you’re looking for a commercial sewing machine that can handle large volumes of work and yet guarantee a straight stitch every time, then the Juki DDL 8700 is the perfect option for you. Third on our list of the best industrial sewing machine is the Singer S16 industrial grade sewing machine. The Singer S16 Studio industrial sewing and quilting machine is an all-in-one sewing machine. It offers every feature that you could ask for at an incredible price. This industrial sewing machine weighs only 31.5 pounds and has dimensions of 20x 9×14 inches. Some of the features offered in this great sewing machine include sewing speeds up to 1600 stitches per minute, an automatic needle threader, a knee lifter, an independent bobbin winding system, a programmable needle, variable speed controls and automatic electronic thread trimmer. One unique feature of this sewing machine is its extra-large sewing space to make even the largest projects seem small. The knee lifter provides a hands-free way to lower and raise the pressure foot making the process much easier. For those of us who struggle with threading a needle due to eye strain, the automatic needle threader makes threading a breeze. The variable speed controls offered with this machine allows it to be set to run as low as 100 stitches per minute or as fast as 1,600 stitches per minute. What else do you need for an industrial sewing machine! Singer S16 is an industrial strength sewing machine that can tackle even the largest of projects with ease. It is easily one of the greatest industrial grade sewing and quilting machines on the market today. This industrial sewing machine is perfect for professional quilters, work at home individual, seamstresses, and sewers. 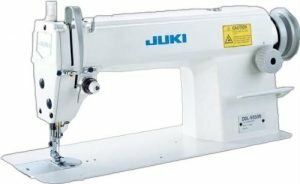 Just second on our best industrial sewing machine list is Juki DDL 5550N: The Juki DDL5550N is great for sewing medium and lightweight fabrics and was engineered to reduce vibration as well as noise which results in a more comfortable operating experience. With a quiet Servo powered sewing motor this industrial sewing machine is great for business or in-home use. Juki DDL5550N heavy duty sewing machine offers sewing speeds of up to 5,500 stitches per minute. It measures 48 x 20 x 48 inches and weighs in at 250 pounds. This amazing industrial sewing machine is powered by the powerful Servo motor that is only 110 volts and quieter than one might think. This product is an all in one unit that has everything you need. It includes all necessary components including working light, a drawer, the motor, stand, table and machine head. If you were looking for a straight-stitch heavy duty sewing machine or perhaps a sewing machine to complete difficult task fast then the Juki DDL 5550N may be the perfect industrial sewing machine for you. Do you often find yourself facing problems with certain troublesome fabrics or having large-scale jobs? If you answered yes then the Brother PQ1500SL high-speed industrial sewing machine may be the answer you have been looking for. The Brother PQ1500SL high-speed quilting industrial sewing machine can sew up to 1500 stitches per minute. Brother PQ1500SL has dimensions of 25 x 11.8 x 14.8 inches and it weighs only 29.8 pounds. This great commercial sewing machine offers a built-in automatic needle threader, push button auto thread trimmers, a knee lever for the presser foot lift as well as an auto needle positioner. This great sewing machine also offers a 12×18 extension table and a retractable drop feed dog control. Brother PQ1500SL high-speed stitching machine offers everything that you could need in an industrial sewing machine. It is definitely a time saver. This industrial sewing machine is durable, reliable and versatile. The Brother PQ1500SL sewing machine is a favourite of those who enjoy free motion quilting, outline quilting or grid quilting. If you’re in need of high speed and heavy duty sewing machine with a lot of extras and extras, then check out the Brother PQ1500SL! If you are looking for perfect stitches, a great value, high speeds; portable industrial sewing machine then I would recommend the Juki DDL 8700. 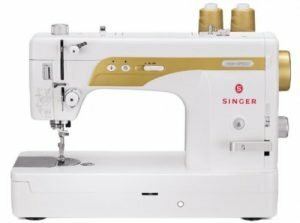 If an industrial sewing machine with variable speeds, convenient features and extra-large sewing space is what you are after I would recommend checking out the Singer S16. If you’re looking for a valued sewing machine to tackle all of your major quilting projects, I would highly recommend the Brother PQ1500SL for an all in one industrial sewing machine. It’s our top choice. As you can see the industrial sewing machines for sale on the market today are as diverse as the projects you could complete using them. With so many options and many different features, it is hard to pick the best industrial sewing machine for your needs. I hope that this review helps you to pinpoint the perfect commercial sewing machine for your needs. What do you think about this list? Do you still have a problem deciding? Leave a comment and I am sure going to get back to you.